The presence of some of the leading cloud computing providers and major Chinese suppliers of e-Sports games will be a highlight of the MGS Entertainment Show next month, said Jay Chun (pictured), chairman of the event’s organising body, the Macau Gaming Equipment Manufacturers’ Association (MGEMA). MGS Entertainment Show – previously known as the Macao Gaming Show (MGS) – is an annual event based in the city and featuring a casino industry trade exhibition and conference. This year’s gathering is to be held from November 14 to 16 at Cotai Expo in the Venetian Macao casino resort. Representatives from cloud computing providers Alibaba Cloud and Amazon Web Services will be attending the conference portion of the event – known as the MGS Summit – as part of the “Smart City” theme for this year’s gathering, Mr Chun told us. “They will share how their cloud technology can help the industry to grow, and save costs, and how to help their clients to keep their database secure – because actually the security level of the services provided by these two companies is amongst the highest in the world,” said Mr Chun. In Macau, the Personal Data Protection Law requires anyone wishing to operate a database featuring automated systems that process personal information, to get permission from the city’s Office for Personal Data Protection, that bureau had told GGRAsia in January. The clarification followed a debate locally about a possible junket credit database being set up in Macau. Alibaba Cloud, based in Hangzhou – a city in China’s Zhejiang province that has become a national centre for information technology business – is said to be China’s largest provider of public cloud computing services. It is part of the Alibaba Group led by Chinese businessman Jack Ma. The entrepreneur – also known by his Chinese name Ma Yun – this summer made an agreement with the Macau government “to bring improvements to the territory’s infrastructure for tourism, healthcare, transportation and government”. Aside from hosting an MGS Summit session, Alibaba Cloud is also showcasing its services via a booth at the upcoming trade show. “Their [Alibaba Cloud’s] participation in MGS is [via] their cloud services… from my understanding, one of the big institutions here [in Macau] is working with them already, [having] placed some data on the firm’s cloud,” Mr Chun told us. He added that the “institution” he referred to was one of the city’ six licensed operators of casinos, but he declined to name it. Mr Chun additionally stated that this year MGS had invited several Chinese providers of e-Sports games to the MGS Summit.They will join a discussion panel on the conference’s second day. “Everybody in the gaming industry is wondering what the next generation [of consumers] likes; which is [likely] not the slot machines you see now but some social games and e-Games… That’s why we are bringing the industry participants from this sector [e-Sports] to see how they can find opportunity in the gaming industry,” Mr Chun said. He noted there would be approximately 170 exhibitors at this year’s MGS Entertainment Show, including the Macau casino junket operators Suncity Group and Golden Group. 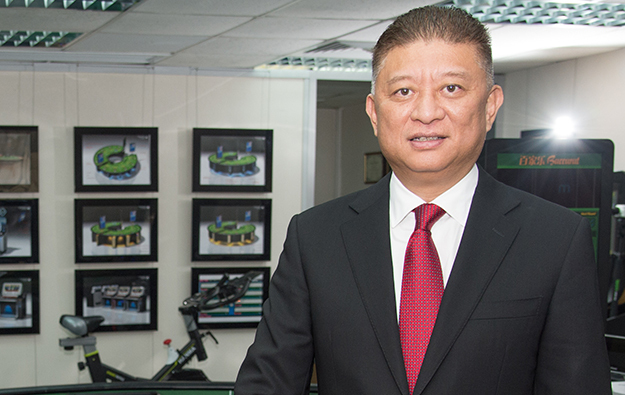 As well as heading MGS, Mr Chun is chairman of Hong Kong-listed casino equipment maker Paradise Entertainment Ltd, which develops, supplies and sells electronic gaming systems in Macau and internationally under the LT Game brand. The trade show feature new product launches from LT Game, including a multi-roulette product and two virtual horse racing products, Mr Chun told us. “This year we got approved [by the local gaming regulator] already, and they [the products] are ready for launch,” he said, noting that the latest versions of the virtual horse racing products had improved graphics and had sparked interest among the city’s casino operators.